"This native perennial can be found along waterways and roadsides east of the Rocky Mountains, and produces bursts of small pink and purple blossoms from spring to summer. It can reach a height of 2-6 feet. An aggressive spreader, so be sure to give it plenty of room or remove new shoots to keep it under control. Like other milkweed species, common milkweed is considered an important pollinator plant especially to the monarch butterfly. 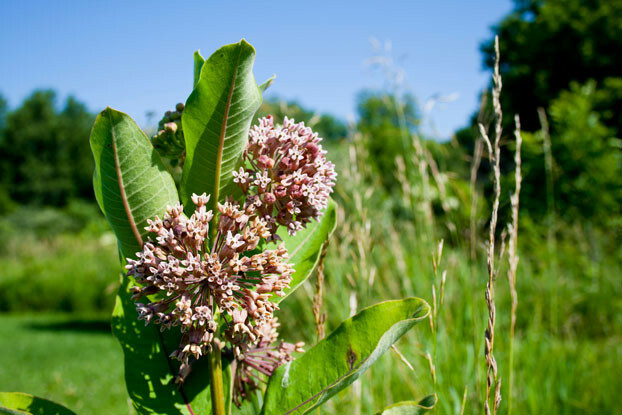 Scientific Name: Asclepias syriaca "
This native perennial can be found along waterways and roadsides east of the Rocky Mountains, and produces bursts of small pink and purple blossoms from spring to summer. It can reach a height of 2-6 feet. An aggressive spreader, so be sure to give it plenty of room or remove new shoots to keep it under control. Like other milkweed species, common milkweed is considered an important pollinator plant especially to the monarch butterfly.